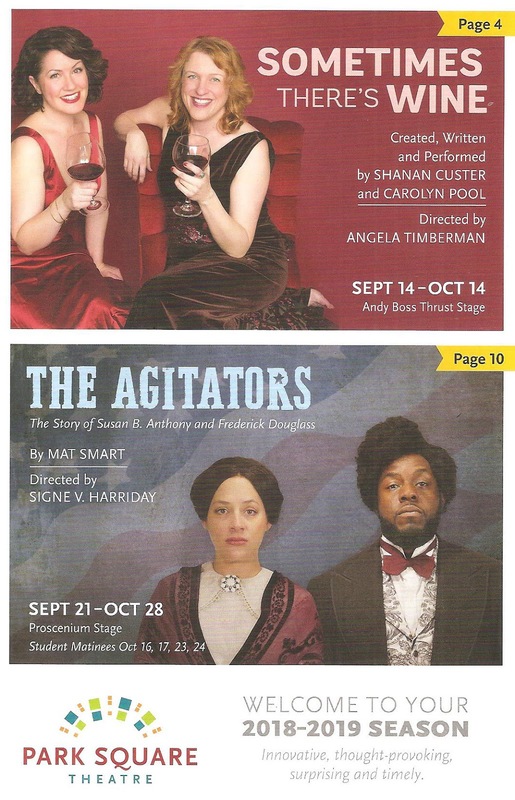 When planning their 2018-2019 season, Park Square Theatre couldn't have known how timely and relevant The Agitators would be. But then again, the lives and work of Susan B. Anthony and Frederick Douglass will never not be relevant and urgent until their dream of an America that is equal and just for all is realized. And we have not yet reached that day. That's why football players take the knee during the National Anthem, and why women take to the streets in pink hats. It's the legacy of these two self-described (at least in the words of the play) agitators, people who stir things up and get people talking, because that's where change begins. Their legacy is also our right to vote, which these two (among many) fought so hard to secure for all Americans. With what feels like the most important mid-term election in history approaching, it's a perfect time for this play to remind us just why the vote is so important that these two agitators devoted their entire lives to it. Playwrights' Center core writer Mat Smart's smart (pardon the pun), funny, engaging, and inspiring play couldn't come at a better time. 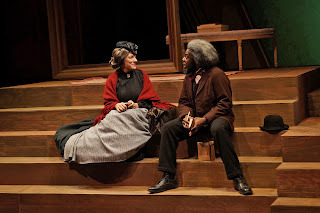 I knew of Susan B. Anthony and Frederick Douglass, of course, but I never knew they were friends and colleagues. The beauty of this play is not only that it explores that friendship, but also that it brings these two people alive in a way that history books never could. You get to experience these two iconic figures as real human beings. 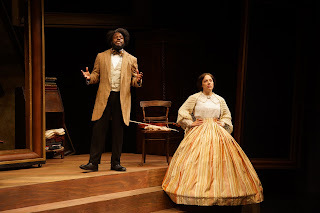 The play begins with their meeting in 1849 at Susan's family's home, which was near Frederick's home in Rochester NY. We follow them through history until Frederick's death in 1895, with conversations and meetings every few years along the way. Their common goal of suffrage for all was intersectionality before that was a thing, although each made compromises along the way which disappointed the other. Frederick supported the 15th Amendment in 1869 that ensured the right to vote for all races, but not women. Susan reluctantly agreed to a Women's Suffrage meeting in Atlanta where they refused to allow black women to attend. Both believed these compromises would eventually lead to enfranchisement for all. They disagreed on methods but remained friends to the end, and the depiction of this platonic friendship between a man and a woman (a rare thing in theater/entertainment) is sweet and touching on a personal level, and their work towards a common good is inspiring on a larger level. I can't think of two better #TCTheater actors to take on this two-hander than Mikell Sapp and Emily Gunyou Halaas. They work really well together under director Signe V. Harriday, and both bring out the humanity in their characters as well as their intelligence, determination, and undying dedication to their cause. The story takes place in multiple locations on the East Coast over 46 years, and rather try to depict them all realistically, the set (designed by Sarah Brander) is a more abstract background that works for all of the locations. Several large empty frames, sometimes used as doorways, hang throughout the multi-level stage, with just a few period set pieces (a trunk, wardrobe, desk) as reference. We sometimes see the actors changing clothes on the side of the stage as they ready for the next scene, so that the two actors rarely leave the stage. And speaking of the clothes, the detailed period clothing includes a parade of gorgeous full hoop skirts (which Emily navigates and manipulates as if she's been wearing hoop skirts all her life). And a shout-out to wig designer Robert A. Dunn for realistically replicating the iconic looks of both of these historical figures as they age. The Agitators opens at the end of a week that saw Dr. Christine Blasey Ford's historic and emotional testimony before the senate committee regarding the appropriateness of a Supreme Court nominee. Dr. Ford is an agitator, a role I don't think she ever wanted, but one she stepped up to fill when called upon to fight for the rights of women, victims, and the powerless to be heard and to be told they matter. 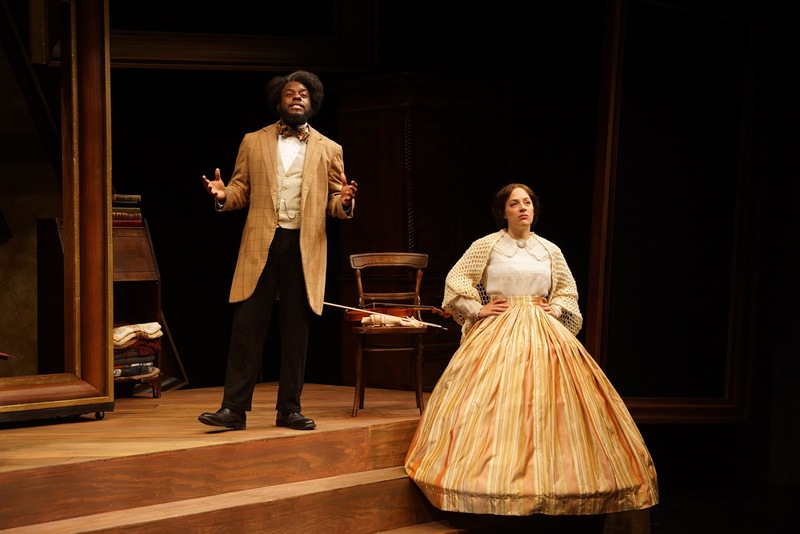 Several scenes in the play feel particularly relevant this week, when Susan speaks of the many women she knows who are raped or beaten with no recourse; women at the time could not own property, vote, or divorce their husbands. That may have changed, but the dilemma of women not speaking up at personal injustices because no one will listen has obviously, painfully not. Another particularly resonant line is Frederick telling Susan upon their first meeting that the only thing harder than listening to a black man is hearing him. The Agitators is full of such moments, and manages to be educational and political without being preachy or dry, in fact it's quite entertaining. It's exactly the play I needed this week, and what we all need to remind us to vote and continue to agitate! Agitate!! Agitate!!! 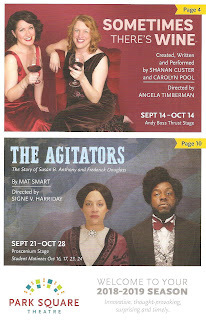 The Agitators continues through October 28 on Park Square Theatre's main stage (with the very funny, real, and feminist Sometimes There's Wine playing on their second stage downstairs).